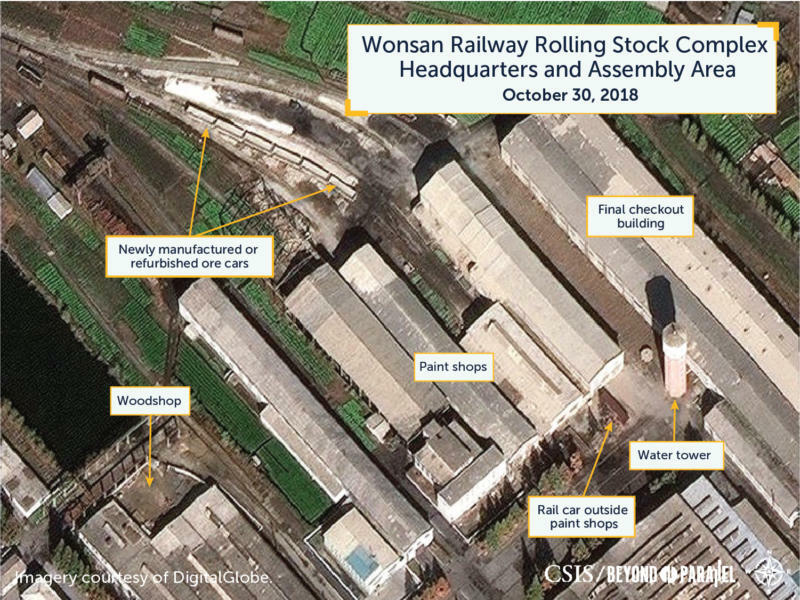 Update on North Korea's largest railroad rolling stock manufacturing and repair facility. 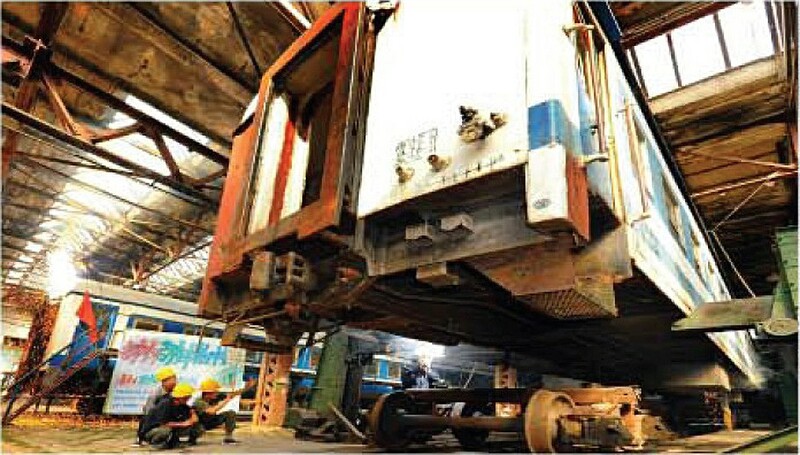 The continued dominance of ore cars at the complex is likely both a reflection of the nations emphasis upon the extractive industries and the need to replace or refurbish heavily used rail cars. Trends in new imagery from July and October 2018. 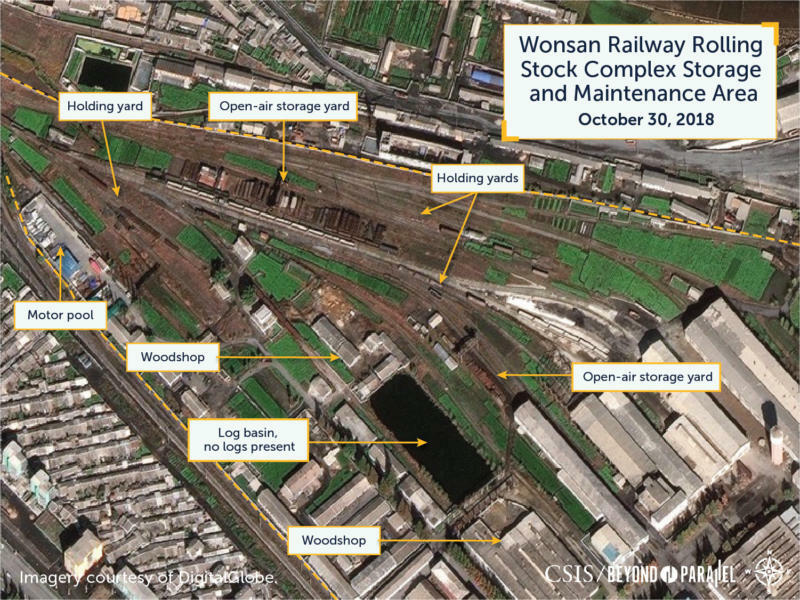 The Wonsan Railway Rolling Stock Complex, located on the southern outskirts of the east coast port city of Wonsan, is the largest railroad rolling stock manufacturing and repair facility in North Korea. Commercial satellite imagery from DigitalGlobe collected on July and October 2018, as well as ground imagery released by North Korean media, indicates that the Wonsan Railway Rolling Stock Complex remains operational and is actively engaged in the manufacture of new ore cars, probable refurbishment or repair of additional ore cars, and the repair or production of general freight and passenger rail cars. The imagery from July 26 and October 30, 2018 shows that the total number of railcars observed at the complex remains in between the high and low numbers presented in our earlier report with approximately 74 visible in the July 26 images and 63 visible in the October 30 images. Ore cars dominate those observed at the complex with approximately 32 (43%) being present on July 26 and 25 (39%) visible on October 30.2 The remaining rail cars present consists of box cars, tank cars, flat cars, locomotives, and unknown (a category that is due to cars that are partially obscured by structures, in shadows, or where the resolution is insufficient to made a clear determination). The continued dominance of ore cars at the complex is likely both a reflection of the nations emphasis upon the extractive industries (e.g., coal) and the need to replace or refurbish heavily used rail cars that have received little or no routine maintenance. Ore cars can be seen in both images not only in the holding yards but dispersed around the complex near the paint shops, assembly halls, and shops. (See more images in Timeline section). The presence of over 200 logs floating in the log basin in the July 26 image and the absence of those logs in the October 30 image strongly suggests that there was a production or repair program involving freight and/or passenger cars during July through October. These types of rail cars make extensive use of wood, while most other rail cars produced at the complex primarily use steel, iron, and aluminum. (See more images in Timeline section). 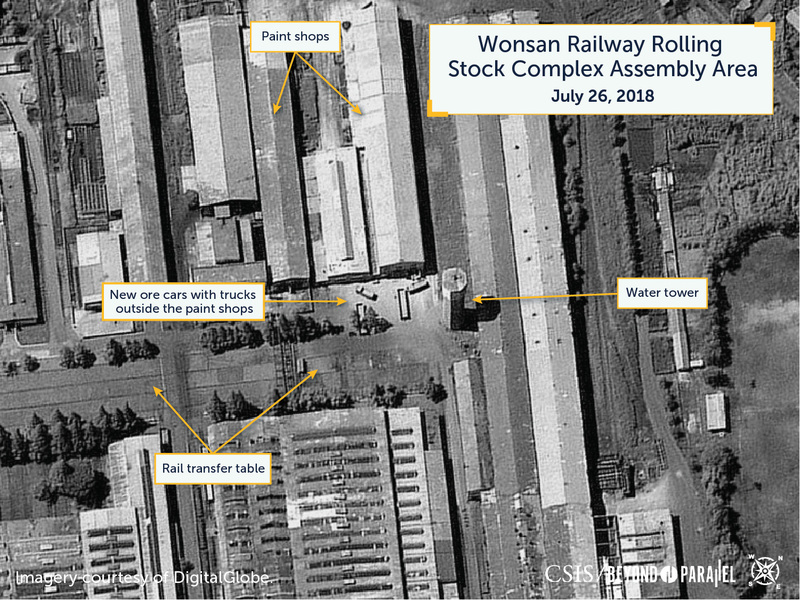 This supposition may be supported by an image published in Nodong Sinmun on August 3, 2018 that shows passenger cars being manufactured at the Wonsan Railway Rolling Stock Complex. 1. Such gardening is typical of large industrial facilities in North Korea. 2. These numbers should be viewed as approximations as they only count the railcars present within the complex and engine servicing facility, not the adjacent Kalma Rail Station and holding yard. Additionally, the numbers do not account for the limited number of satellite images reviewed or seasonality. 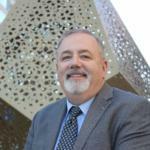 A more comprehensive study would likely provide a more nuanced understanding and reveal an explanation for the apparent decline. No logs in basin suggests passenger/freight car work because of extensive use of wood. Source(s): Image courtesy of DigitalGlobe. The continued dominance of ore cars at the complex is likely both a reflection of the nation’s emphasis upon the extractive industries (e.
The continued dominance of ore cars at the complex is likely both a reflection of the nation’s emphasis upon the extractive industries (e.g., coal) and the need to replace or refurbish heavily used rail cars that have received little or no routine maintenance. Ore cars can be seen not only in the holding yards but dispersed around the complex near the paint shops, assembly halls, and shops. Production or repair program involving freight and/or passenger cars. The abundance of logs in the log basin in July 2018, and their absence in October 2018, suggests a production or repair program for freight and/or passenger cars. The abundance of logs in the log basin in July 2018, and their absence in October 2018, suggests a production or repair program for freight and/or passenger cars. 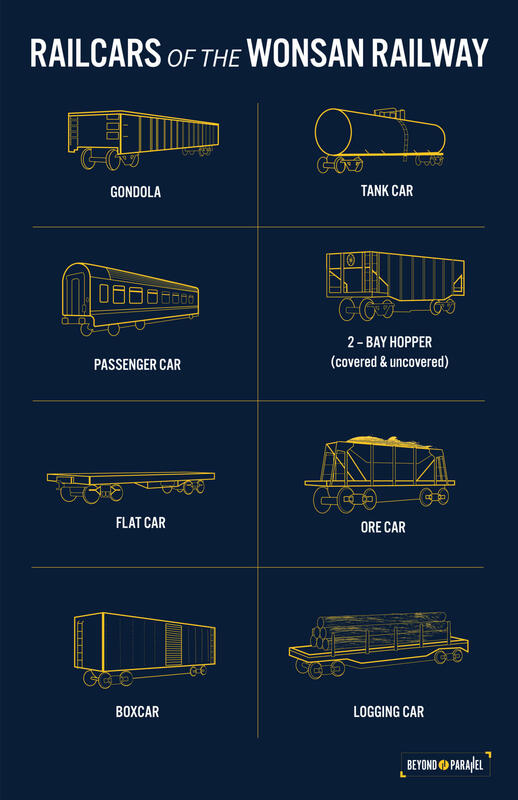 These types of rail cars make extensive use of wood, while most other rail cars produced at the complex primarily use steel, iron, and aluminum. Ore and passenger car activity is up. 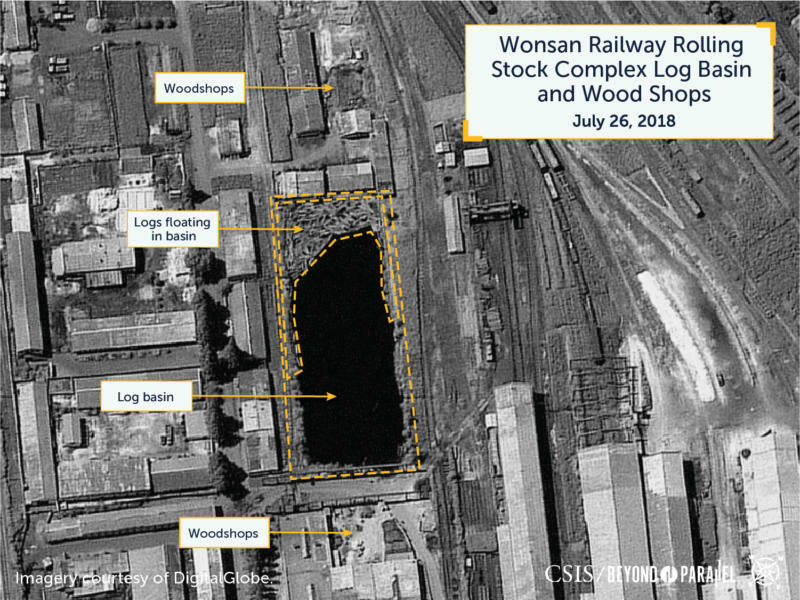 An upcoming report on mining trends in North Korea may help explain the increased activity of ore cars at Wonsan. Initial mining report expected in early 2019. Authors are under no obligation to respond to every comment. Please keep the comments constructive. The Ice Curtain: Why is there a new Russian military facility 300 miles from Alaska?